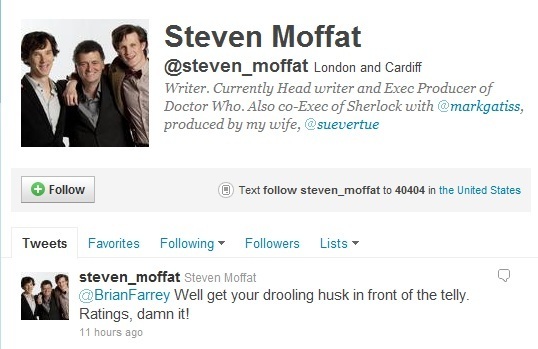 Have a brief but incredibly meaningful conversation with the current DOCTOR WHO showrunner, Steven Moffat, a man whose work you greatly admire. Also of note: 11 hours later, the tweet to me was still at the top of his Twitter feed. As if he couldn’t bear to tweet someone else and move me down a notch from such a place of importance. 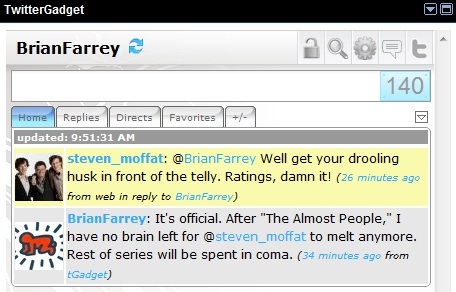 The subtext might as just well say, "Yes, world, Brian Farrey and I are BFFs." 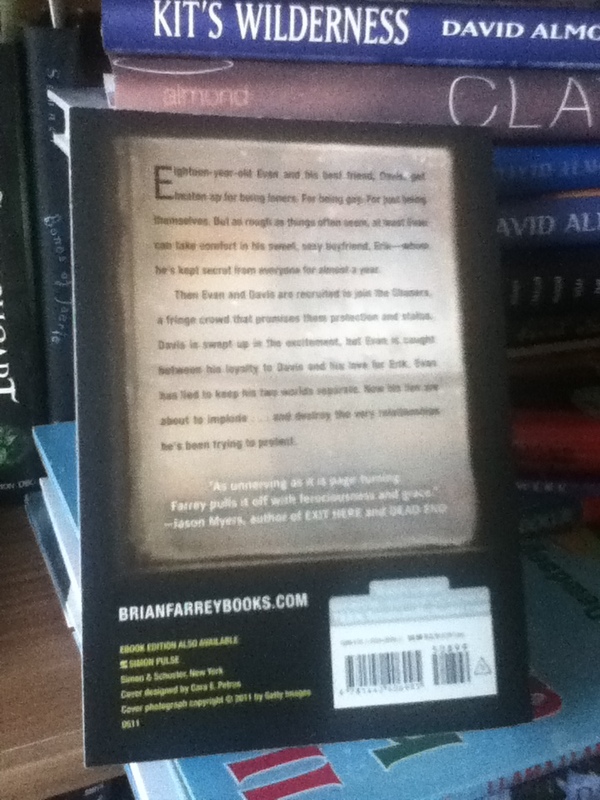 Henceforth, I shall be known as Brian Farrey: Editor, Author, Drooling Husk. My favorite opening line from a YA novel. Why being pedantic means I’ll be the first to die in the zombie apocalypse. The Christmas gift I pitched a fit to get. Winners of the Contests to be named next week. More fun stuff on the way. Stay tuned! on May 30, 2011 at 9:47 am	Comments Off on Take that, Karen Carpenter! The majority of WITH OR WITHOUT YOU is set in Madison, Wisconsin, a city I love a lot. One of the story lines involves Erik, an amateur sculptor, unveiling a commissioned piece in a Madison park. Erik’s sculpture is of a pair of angels, fashioned from steel, who rise up over the park to defend the defenseless. The location in my book is fictional but it’s loosely based on Olin Park. 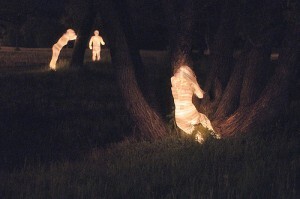 So I enjoyed reading about this installation by Christopher Murphy that can be found in Madison’s Olin Park. The sculptures are awesome and this picture has a wonderfully creepy vibe. I think it would make an awesome book cover. on May 27, 2011 at 8:47 am	Comments Off on Ready or not, here I come! Been slaving over your NANOWRIMO manuscript for months and would like a professional opinion? Thinking you need to do one more draft before sending your work-in-progress out to agents but need input? This is the contest for you! As many of you know, during the day I’m the acquiring editor for Flux, the young adult imprint of Llewellyn Worldwide. In this capacity, I’ve worked with New York Times Bestselling authors Simone Elkeles and Maggie Stiefvater. 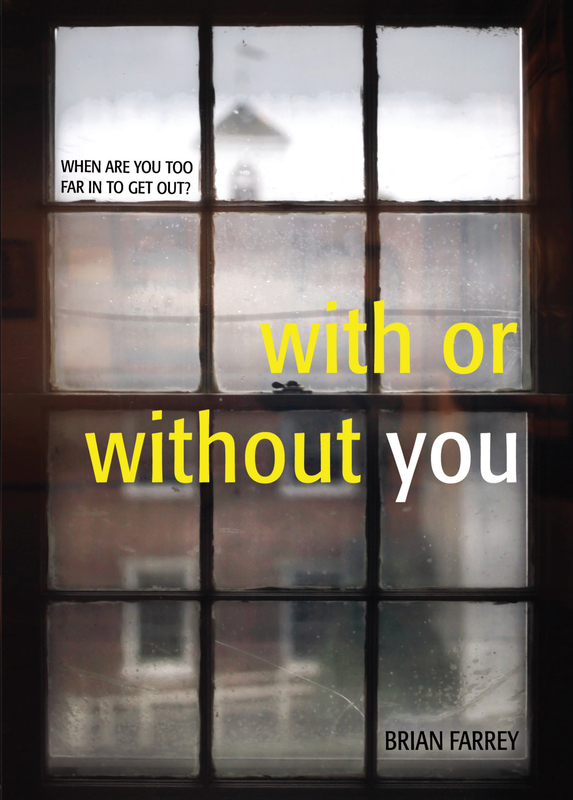 And if you’ll help me promote my new book, I’ll turn my critical eye to your manuscript. First prize is a manuscript critique. I will read up to 60,000 words of your work –in—progress and provide you with detailed, written comments. Second prize is a partial manuscript critique. I will read the first 50 pages of your work-in-progress and provide you with detailed, written comments. Third prize is a micro-critique. I will read the first 10 pages of your work-in-progress AND your query letter and provide you with detailed, written comments. 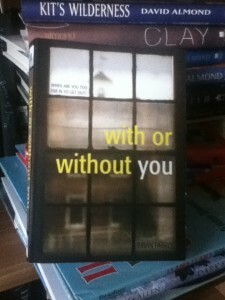 All prizes also include a signed copy of WITH OR WITHOUT YOU. Three chances to win right there! And feel free to tweet #2 and #3 as often as you like for additional entries. (But, y’know, don’t scare away your own followers by filling up your feed.) The contest ends June 6 at 11:59pm Central time. Using a random number generator, I will determine the three winners and contact them via Twitter DM. 1) My reading of all work is not in my official capacity as editor of Flux. Meaning that by sending me your work for review, you understand that it is not being submitted for consideration to be published by Flux. Flux, and its parent company Llewellyn Worldwide, have nothing to do with this contest. 2) I require a minimum of two months to respond after winners have submitted their materials. 3) All winners must submit their work to me within six months of winning. (In other words, winners should not start writing the moment they find out they won. Ideally, they should start tightening an existing manuscript before sending it.) Submissions must be in the form of an MS Word document (please no PDFs and definitely no Works files). No hard copy submissions. 4) Why is 60,000 words the cut-off for a “full” manuscript critique? Because I firmly believe that if you are an unpublished writer, this is the ideal length (or even shorter) for your debut. If your manuscript is more than 60,000, I will only read the first 60,000. But, hey, that’s still a SUBSTANTIAL part. There will be one first prize winner, one second prize winner, and one third prize winner. Of course, not everyone who may be interested in winning is a writer. Some people just read for the thrill of it. I like those people and I want them to feel included. So here are the prizes for the non-writers. Third prize is a $25 gift card to the book retailer of your choice (Amazon, Barnes and Noble, Borders, Indiebound, etc.). *=Please note: the signature in this book is the stamp signature developed for Suzanne Collins when she went on the Mockingjay tour in late 2010. First, let’s talk about The Bet. You can learn about it here. For the record, I won The Bet and don’t have to write a story (which I’m cool with because I’m on deadline and don’t have time to anyway so there). As a result of The Bet, today you will be treated to three original short stories by authors Catherine Ryan Hyde, Kimberly Pauley, and Andrew Smith. Go read and comment on their offerings. BTW, reading these stories from established and wonderful writers is 100% free. Here’s where you’ll find me guest posting over the next week. And finally, we should talk about the Contest. Come back here to this blog tomorrow at 12pm CST to learn details about a contest where writers can win a full manuscript critique from a real, live editor and reading enthusiasts can win signed, first edition copies of books from today’s finest YA writers. Nothing to bid on. No purchase necessary. All you have to do is help me spread the word about WOWY and I’ll tell you how. UPDATE: There’s a short bit about WOWY and mini-interview on Adventures in Children’s Publishing. 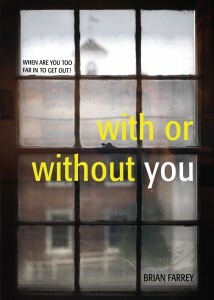 Just over a week until the release of WITH OR WITHOUT YOU! (Or, as we call it in these parts: WOWY!) My blog tour continues this week with a couple (planned) reviews of the book (I say [planned] because I’m hoping the reviewers have received their copies by now…) and my thoughts on any number of fascinating topics. 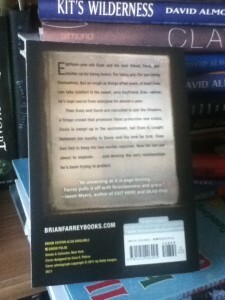 on May 16, 2011 at 6:56 am	Comments Off on The Blog Tour Continueth…. As May 24 comes precariously closer, I’m being bombarded by reminders that, yes, I actually am about to have my first book published. 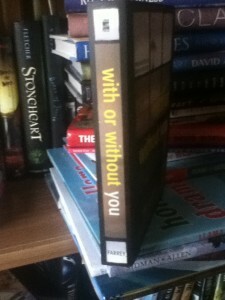 First up: the actual book! It showed up at my door, looking all pretty! More blog tour stops to be announced soon. Much thanks to Kari, Mandy, and Zoe for sharing their blogs with me and kicking off the tour! Coming soon: details on The Contest. (No, not the one from Seinfeld. Pervs.) This Contest will be a chance to win some fabulous signed books by some of the best YA authors around AND there’s a chance to win a FULL manuscript critique by an actual, real live, honest-to-goodness young adult editor (for you writers out there)…. This came about because Stephen King had just published a short story in The Atlantic and an accompanying interview revealed that he wrote the story because he lost a bet with his son (and his son provided the title: “Herman Wouk is Still Alive”). I mused on Twitter how fun this might be and suddenly these three wonderfully nutty people took me up on creating such a bet. I’m the first to admit: short stories are not my milieu. I adore reading short stories. I even dabble in writing them from time to time. But I find them to be very difficult for how my brain works. And I’m a bit out of practice. So I’m just a tad nervous. corpse.” What amazed me about Ellison was that he didn’t even stop to think about it. He got the idea and immediately started typing. And as he finished pages, they were taped up in the window for all to see. No editing. No changing. No nothing. For the record, *I* will not be doing that, should I end up writing a short story. *I* will think long and hard before I start writing. *I* will change and edit and, most likely, fret over the whole thing. But, I will also try to enjoy working outside my level of comfort. The horse I’ve chosen to win is called Dialed In. Fingers crossed. Here, then, is my contribution to this seldom discussed piece of craft. 1. Get an idea (check the Sunday paper, sometimes Target has a sale). 2. Make sure it’s a really good idea. Ask your cat. If she sleeps, it’s a really good idea. 3. Research the YA market and learn that someone else did your idea. Sort of like how you planned, only better. 4. Buy a live chicken, some salt, and a ceremonial dagger. 5. In a field near a graveyard at midnight, draw a pentagram with the salt and sacrifice the chicken. 6. Curse the name of the author who stole your idea. Said curse might include, but should not be limited to, poxes, bodily leakage, poor judgment, spontaneous combustion, spontaneous tap dancing, unrelenting sorrow and porridge, intermittent gravitas, and mistaken identity. 7. Google the author to see if the curse worked. 8. If the curse did not work, repeat with step 1. 9. If the curse worked, supply me with a list of ideas you’d like me to stay away from and I’ll do so unreservedly thank you very much and my you’re looking nice today unholy one. *=Yes, I”m aware of how completely awful that metaphor is. I’m giving it to you as a gift. 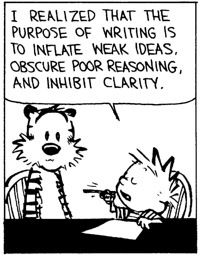 Consider it a weapon the next time someone criticizes your writing. Whip that puppy on them and watch their brains implode. You can thank me later. Or now. **=Please note that while the term “YA novel” is used, these methods can be invoked as you approach writing just about anything. The advantage of using this as you prepare to write a grocery list is that the chicken doubles as both sacrifice and dinner. on May 2, 2011 at 7:13 am	Comments Off on It’s all about the execution.